The Belarusian, 23, came back from a set down to win 4-6 6-4 6-3 on a cool and blustery evening on Rod Laver Arena. The victory brought Azarenka her second Grand Slam title after last year's win at Melbourne Park, and ensured she will not be overtaken by Serena Williams in the next world rankings. Either way, the negative attention she garnered in the build-up only added to the support for the already popular Li. 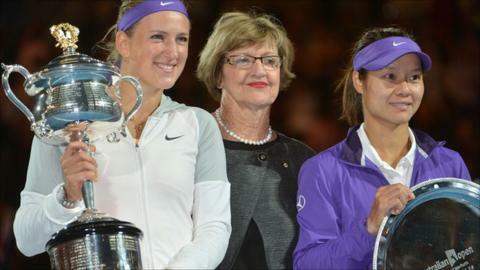 "Unfortunately, you have to go through some rough patches to achieve great things," said Azarenka. "That's what makes it so special for me. I went through that, and I'm still able to kiss that beautiful trophy." China's Li, the 2011 French Open champion, had marginally the better of a desperately scrappy first set of 32 errors and 16 winners between the pair. Li was much the more effective on the return and after recovering from 5-2 down to 5-4, Azarenka double-faulted on set point, summing up her evening to that point. A few calls from the boisterous Australia Day crowd probably did not help, although at times it appeared that Li was as distracted by her own vociferous supporters. Azarenka made a strong start to the second set with a double break as Li's famously unreliable radar went haywire, but the sixth seed was battling back at 3-2 down when she suffered a fall. "Victoria Azarenka is a warrior. It has been very rough for her, but it has been a tremendous effort tonight. It has been very gutsy. It has not been the best quality match, but it was enthralling." She hobbled back to the chair and took a medical timeout of her own to get her left ankle taped, leaving Azarenka to don her tracksuit top and practise a few serves. It looked as though the timeout had worked against Azarenka this time when Li came out firing with five points in a row, but the top seed clung on from 0-40 to stay ahead. Li then offered up four errors in a row to give Azarenka the break at 5-4, and she closed out the set to force a decider. After breaks were swapped at the start, Li looked to be regaining some sort of control at 2-1 up only to be interrupted for nine minutes by the annual Australia Day fireworks display. Disaster struck on the resumption, when Li crashed to the ground during the first point and rolled the same ankle, before cracking her head on the court as she fell. The sixth seed looked dazed, although she did manage a thin smile when her face appeared on the big screen, but she needed another timeout, and again Azarenka went through an unexpected practice routine. Li resumed firing forehands but Azarenka held on to her serve at 2-2 and then got the decisive break in game five, hanging on to it when Li squandered a break point at 4-3 down. After struggling to hold on to her serve in the early stages, Azarenka was now attacking her opponent's with similar gusto. The world number one avoided having to serve out when Li floated a forehand long on championship point, the Belarusian dropping her racquet and burying her face in her hands in celebration. "I will always keep a very special memory of this court and you will be in my heart forever," Azarenka told the crowd in her post-match on-court interview. Li admitted the better player had won, but joked:"Without falling down I was feeling pretty good. "It was a very tough match. She's number one, defending champion. I think today in the important games she was playing better than me, so that's why she can win the title."